One of the more prominent publicly traded cannabis companies has come under fire recently in blogs and stock message boards for its financial accounting methods and other issues, spooking investors and forcing the firm to address the allegations in a recent letter to shareholders. Amid these concerns, Medical Marijuana Inc.’s stock price has fallen more than 60% since reaching a 52-week high in mid-February (though other factors likely contributed to the decline as well). Let this be a cautionary tale for investors: If you’re going to put money in cannabis stocks, you must have a relatively high tolerance for risk and brace yourself for volatility and uncertainty. The same types of criticisms directed at Medical Marijuana Inc. have been levied against other cannabis stocks as well, given that most publicly traded marijuana companies are not required to release detailed financial documents because they trade on the over-the-counter market. This makes it difficult to get an accurate reading of their financial health. These types of “penny” stocks are also subject to extreme price swings, so big moves in either direction over a relatively short period of time are common. The recent criticisms of Medical Marijuana Inc. mainly originate from several posts on the stock-focused website Seeking Alpha. 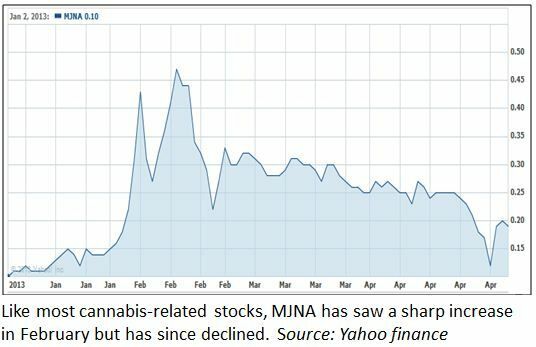 The posts have lit up online stock message boards and helped push down MJNA’s shares – despite the company’s improving financial position, the fact that there have been positive articles written as well and the rapid growth of several of its portfolio firms, including Dixie Elixirs & Edibles. Medical Marijuana Inc.’s share price has fluctuated significantly so far this year. It rose sharply in February on news of strong fourth-quarter financial results and general optimism about the marijuana industry but then – like other MMJ stocks – fell sharply in the following weeks. It now trades at about 18 cents a share, down from its recent high of 50 cents but still well up from its 52-week low of 2 cents. It’s also up 80% so far this year. – Admits to some mistakes that caused financial reporting delays and difficulties in getting products launched. – Said it needs to do a much better job of communicating with shareholders. – Announced that Michael Llamas – the controversial director of Medical Marijuana Inc. who has a checkered past – is no longer an executive or board member of the company. However, Medical Marijuana Inc. Chairman and Chief Operating Officer Michelle L. Sides defended the company against many of the criticisms. The letter says the company is operating in compliance with reporting requirements and has conducted business in an ethical manner. It also is consulting with its attorneys about possibly taking legal action against certain blog writers at Seeking Alpha. Sides told MMJ Business Daily that the recent critical posts “created doubt with our shareholders, and we wanted to quash that as soon as possible and move on.” She also highlighted the strong underlying growth of the company and its portfolio firms, saying that the future is bright for Medical Marijuana Inc.
Christopher Berrie, who heads up investor and public relations for Medical Marijuana Inc., said the company is looking at this in a positive light, viewing it as an opportunity to learn from its mistakes and develop a stronger relationship with shareholders. In fact, the company said it is currently hiring additional workers in marketing, production, sales and operations, and it is moving into a larger facility to accommodate recent and projected growth. Not exactly the signs of a company about to go under. Well done. Just a word here and there makes everyone feel better. So happy to get updated from your excellent website! I believe in MMI and will continue to invest in them!! He really doesn’t have any financial ability (nor do I) but he means well. Sure he tries to drain money from retirement accounts so he he can make a few buck on SA. But so what, I do it too. Good luck to all. I admire Alan. We have our own basher’s club. Please join. Also send money so Alan can finish college. Very nice article. The company has a significant number of disclosure issues in my view. Hopefully, as it becomes more transparent, investors can be more confident. For now, though, revenue recognition appears to be very aggressive. According to CannaVEST’s 10-K, it had sold only $1.275mm of CBD oil since its inception, which raises the question of how MJNA is able to book so much revenue (PhytoSPHERE, which is 80% owned by MJNA, had already booked $10.5mm in revenue in Q4 and Q1). Further, CannaVEST stock (CANV) hasn’t traded since 4/26. The quoted price is well above the $6 price used in early April for the $6mm transaction. CANV was purchased for 5 cents a share in November according to its filings. Investors should be very skeptical in my view. The Richard Fearon’s of the world have made millions, but spent billions trying to defeat marijuana for a net loss. Alcohol, cotton, oil, pharma and the gov’t have all failed and are in fact the greater fools. That’s really funny that some joker is trying to impersonate me. I have several thousand dollars in MNJA stock and will continue to buy more stock as the profit picture becomes more tranparent. As more states legalize marijuana, this could turn into the new APPLE! I would suggest the company (in light of the recent profit picture)instead of reinvesting in itself more, issue a one-time dividend payment (even a penny a share) as this would bolster invester confidence. So, Tudo, maybe Dixie dewdrops just aren’t for you. Take another toke and relax. Hey Jim, gee for some reason I just never was interested in scams like this one who produce some laughable garbage made from stems and the crap people throw away. But feel free to buy it or even make an investment. Back to some real oil from Tetra Labs. I am new here and extremely interested in investing in Medical Marijuana. I will admit what is holding me up are the over-the-counter-stock issues. I am waiting for the very second they hit the exchanges. Another problem is that since I want to go through Scottrade, I cannot do IPO offerings which carry their own problems. Please do not choose to do IPO which will lock out a lot of people. I would really appreciate some follow-up and more news on these issues. To no avail, The Trading Crook, outsmart's the SEC, and FINRA, "For they Do NOT double check the share's from Off Shore, to a Brokerage, that Put's int CEDE say 5 to 10 to 25 Million shares, and OH Golly Gee! The Legend "Disappeared', if they The GOV Bodies were More Diligent & knew where to LOOK,& How,to read Transfer sheets, and Follow the "Large Cert's with a Legend, and see, How 2-3 4 Transfer(s) seem to Erase the RED Legend onthe back of the Cert, and I have NOT seen Too many "Legal Opinion Letters come through on 7 Huge Trade's in the 10's of Million's, and CEO's Approving the (144) sale, thus My Opinion is only the TIP of the G&A. As CNBC, American Greed, (Greed & Avarice), and the Smoke screen is there like the "Indian's and their Smoke Rings, that (DOT GOV.) does not know how to Investigate, (144) stock, suddenly FREE Trading Stock, and if certain Bank account's were checked, the IRS, could also pick up Millions. Sorry, but been in and Out of many a Brokerage firm, from NASD, to NYSe, and the AMEX, etc. NO MMJ stock's will not disappear but, filter out some bad seed's trying to get started again, and YES, these letter writers served a purpose, but they too are Crooks in their own way, take 10 companies down 60%, because of a "LITTLE SNITCH" with but a few real fact's blown out of proportion. BUT, People like me know just where and HOW to "LQQK"
THE ( QQ'S ) have it, but if the GOV people get rid of the RATS, the Real & upcoming MMJ Companies can get a Kick start. Typed too fast, and thoughts racing by. Also, the Broker’s that “Time 10 Tickets, then Time his or his relative’s, then, the Stock or Option goes Up, the 10 tickets get ripped, or shredded, and the 1 Ticket and his “Instant Profit” is made, and no one the wiser? BUT, the Manager, should alway keep a much tighter rein on the so called big producer. I was called to many a brokerage firm and their top producer’s, all playing a game with Customer’s monies, that they “The Customer” makes a dime, but his Broker is Skimming and giving false quotes, unless the customer has a level 2, or 3, and get’s real Timly report’s. This and all the other type of FB’s not my forte, that is why I have been called the “Stealth type Broker & trader”, never posted anything like this anywhere. I have reported extensively about issues in and around the whole snakes-nest which is MJNA, HempMeds,Cannavest Cannavest,Phytosphere, etc. on my show, The Farmer in the Sky Radio Hour. According to the US Department of Justice the products HempMeds, et al sell are in violation of the Controlled Substances Act. This is not a rumor. This is what I, personally, was told by their designated spokesperson on this issue.HIA v DEA is not the controlling law in this.In fact, HIA has made a point of distancing themselves from so called “CBD-enriched hemp oil” products saying they should not be referred to as “hemp.” Plus, the Farm Bill of 2014 applies ONLY to research or pilot programs associated with State Departments of Agriculture and/or institutes of higher learning. If ever “buyer beware” ios appropriate, this is it.